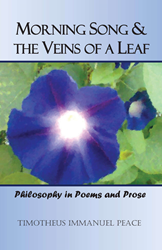 Timotheus Immanuel Peace Releases Debut Book of Prose and Poetry, "Morning Song & The Veins of a Leaf"
To me as an author, words are like paints. Words differing in meaning are like paints of different colors. Conversely, words that are synonymous are shades of the same color. Timotheus Immanuel Peace's first book contains poetry and prose, though it is also philosophical in nature, in that the writings explore many aspects of life deeply. Readers will find evidence of Peace's love of nature throughout the book. Peace explained, "I have wandered in the woods of Texas, New England and other places. And those with paths through them, I find lovelier than sublime highways. Sitting by water bodies, rivers, ponds, lakes, creeks, and so on, are sights so soothing to my mind." While exploring life's perplexities, Peace touches on mysteries, love, introspection, human desires, observations, optimism, pessimism, realism, and the best and worst of human nature. His poems and prose are combinations of archaic and modern writing styles with a substantial delineation from existing conventions—past and present. Peace uses figurative language, and he encourages readers to read between the lines rather than take his carefully-chosen words at face value. When asked what inspired Peace to write this book, he answered, "I just love words. And I decided to share some of what I have composed with readers."